This 6 foot Sunsetter aluminum pole and mounting set simply and elegantly attaches to virtually any vertical surface. Unlike flimsy, poorly-made poles, our pole is made of heavy-duty, aircraft-grade aluminum, with an adjustable bracket and stainless steel flag clips. It's a premium pole, built for years of trouble free service. Heavy duty aluminum pole won't rust. Stands up to wind and weather years after others have broken or bent. Made in America. White baked enamel finish looks beautiful, never needs painting. No ropes to snarl or hardware to clang against the pole. Flags fly freely without tangling. Topped by an anodized Gold Ball. Carries a 5-year Limited Warranty, the best in the industry. 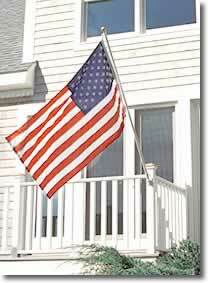 Includes a 3 ft x 5 ft. fade-resistant nylon American Flag with embroidered stars. Adjustable stop helps keep the flag taut. Strong, clear polycarbonate collars with stainless steel flag clips allow easy rotation, to help flags wave freely without tangling. Easily adjust the angle of the pole with a wing nut -- no tools required.